Approx Time 20 to 30 minutes. Two players from each team start either side of the goal and the third starts inside centre circle. One of the team A players from the side of the goal passes the ball to his/her team mate inside the centre circle (Pass 1). 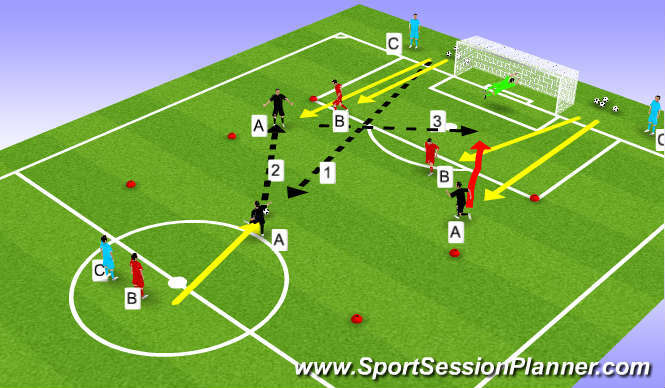 All team A players then enter the playing area along with the two team B players from besides the goal creating a 3 v 2 scenario with team A attacking and team B defending. The receiving player inside the centre circle has to complete a pass before any attempt on goal is allowed. If the defending team win the ball they attempt to complete a successful pass to their player waiting in the centre circle. Once the passage of play is complete the scenario is repeated with the defending team becoming the attacking team and the waiting team becoming the defending team. Rotate all players on a regular basis. Emphasize game related situations as all will be experienced during a game and early recognition to either exploit Overload or combat Underload.